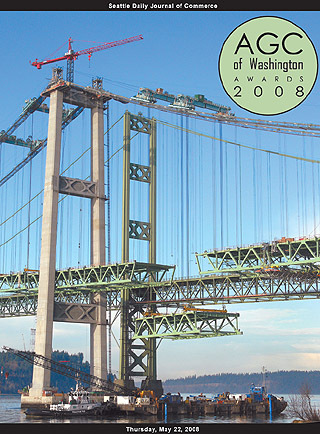 Tacoma Narrows Constructors took home the construction grand award for its work on the new Tacoma Narrows Bridge. Forty-six deck sections weighing an average of 450 tons apiece were lifted and attached to suspension cables. Some of the sections were lifted and then ‘trapezed,’ or swung, into their final positions. The contractor is a joint venture of Kiewit Pacific Co. and Bechtel Construction Co. The Associated General Contractors of Washington on Wednesday recognized some of the state’s most successful projects at the Build Washington Awards event at the Seattle Art Museum. The grand award winner in construction went to Tacoma Narrows Constructors, a joint venture of Kiewit Pacific Company and Bechtel Construction, for the new Tacoma Narrows Bridge. BNBuilders received the grand award for safety, and P.J. O’Brien of John Korsmo Construction was named superintendent of the year. “The Build Washington Awards program is always a great celebration of the innovation, quality and safety expertise of our contractors,” said AGC President Steve Barger of Northwest Cascade. Grant Goodeve, host of KING-TV’s “Northwest Backroads,” emceed the event. Construction judges included Marco Foster of the Washington State Department of Transportation, Carl Molesworth of Pacific Builder and Engineer, Todd Hess of Todd Hess Building Co., Jennifer Wedderman Hay of McGranahan Architects and Carrie Dossick of the University of Washington. Safety judges were Adam Gerson of OSHA Region 10, Rick Gleason of the University of Washington and Roby Robinson of Central Washington University. This year’s DJC special section includes a new feature: interviews with four local construction executives. The topics range from serious to silly, but show these leaders aren’t all hammers and nails. • Dave Zemek, vice president, Kiewit Pacific Co.